For decades we Mormons walked around with an inferiority complex. The Book of Mormon says three groups of ancient immigrants came to the New World across the open ocean in boats. Conventional wisdom held that the first Americans walked across the Bering land bridge during the most recent ice age, then stopped coming when the glaciers receded, sea levels rose, and salt water inundated what had been a convenient terrestrial highway. Native Americans, so the theory went, were snugly ensconced in their private hemisphere free from any significant outside cultural influence until Columbus came along with his guns and smallpox virus and began to wreak havoc on the natives. Because we Mormons believed the Book of Mormon story, we were "diffusionists," a term that carried pejorative baggage with most anthropologists. "Isolationists" aka "independent inventionists" carried the day for generations because the idea of autochthonous development stroked nationalist egos and provided a tidy, continental-scale laboratory for validating Darwin's theory of evolution. Americanists since John Wesley Powell (1834 - 1902) who founded the Bureau of American Ethnology at the Smithsonian in 1879 have vigorously denounced evidence of ancient Old World influence in the Americas as crackpot archaeology on the lunatic fringe, unworthy of real scientists. For many years the diffusionist camp was a rag-tag army of laymen with the occasional rebel scientist or academic willing to go rogue and oppose mainstream thought. Not anymore. There has been a literal sea change of scholarly opinion and it is no longer politically incorrect for Americanists to talk about ancient sea voyages between the hemispheres. The "kelp highway" (marine navigation along the Pacific Coast) is now generally recognized as the principal way the first Americans arrived in the New World from Asia because we have abundant evidence of human occupation in the western hemisphere before the last glacial maximum and subsequent sea rise. The article says Asian sea voyages to the Americas pre-date the Clovis people who specialists believe walked across the Bering land bridge. According to the article, this new understanding is a "dramatic intellectual turnabout." 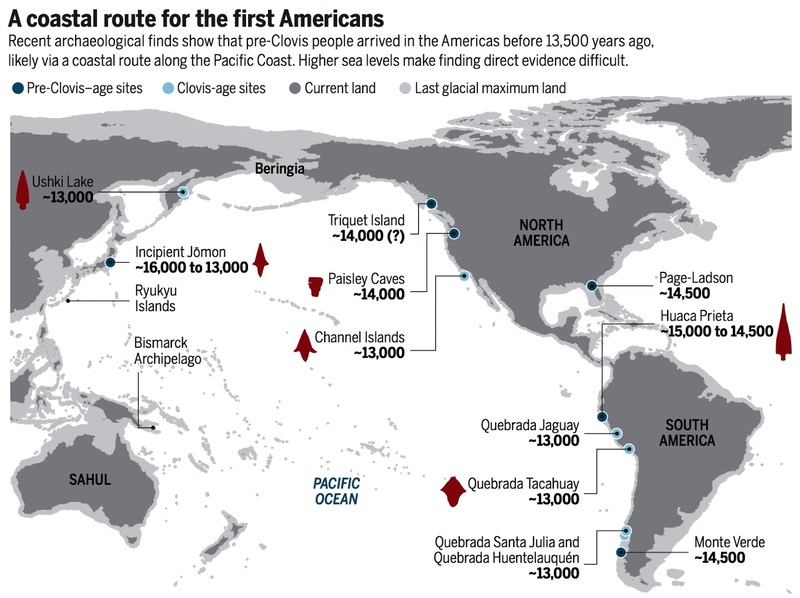 This map shows Clovis and pre-Clovis sites around the Pacific rim. This is not validation of the Jaredite, Lehite or Mulekite voyages, but since people were coming to the Americas 15,000 years ago in boats, the Book of Mormon ocean-going voyage narrative is now plausible and in step with mainstream scientific opinion rather than quirky and problematic. See the article "Ancient Ocean Crossings."